I had the privilege of meeting Gale today at the Baltimore Book Festival and I’m happy to share her work. 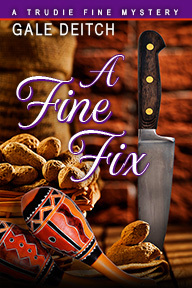 I’m very excited to have Gale Deitch, author of the culinary mystery, A Fine Fix, on the blog today! I’ve known Gale for a long time and she’s a member of my writing critique group. Seeing her book in print is exciting and I’m thrilled for her success. If you like culinary mysteries, you won’t want to miss the first book in the Trudie Fine series! With the tables set, the food prepared to perfection, and the Mariachi band sizzling, Trudie is mellow as a Margarita smoothie…until a dead body is discovered floating in the pool.